Marathon du Medoc. What's not to like about a race with 22 wine stations and an oysters and cognac station on the course? 4:00- 4:30. In my younger days I paced as fast as 3:00. Not any more. Ramones. If I'm running fast. Some of the more acoustic stuff by Dire Straits/MarkKnopfler if I'm taking it easy. Before I run - a banana. After I run a marathon - a stuffed sausage pizza from Giordano's. Pub trivia. We play at our local brewery every week and win most of the time. During the week I run solo or with some coworkers at Motorola. On the weekend, with the Glen Ellyn Runners group of 100+ runners. I started running to lose weight. Now it is my stress reliever. I get really cranky when I am not able to run for any period of time (just ask my wife). 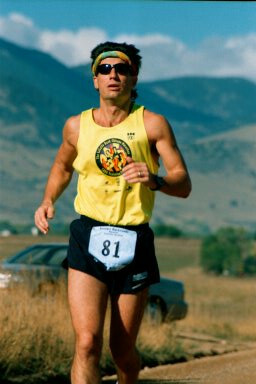 I was running the Jackson Hole Marathon, a small race mostly run on dirt fire roads in the mountains. I had to stop around mile 3 to let a herd of free-range cattle cross the road we were running on. Figuring this would be a scenic course, I was carrying a throw-away camera with me and was able to capture the moment on film (this predates digital cameras being widespread). As someone who always ran all the local races, I never did my share of volunteering to help at races. Pacing is a chance to correct that. For those of us who are over-the-hill and not going to run any time that impresses ourselves any more, it's great to see the reaction of people at the finish line who you have just paced to their goal. It's also a good excuse to not run a marathon all-out and feel miserable at the finish. I was pacing 3:40 at St Louis, and paced a young woman running her first marathon. Her husband was on the course cheering her on. She stuck with me the whole way and nailed her goal. She made a point of thanking me at the finish. I ran an 80 mile relay the next weekend. Lo and behold, who sees me at the finish and makes a point of thanking me again - her husband. Practice makes perfect. 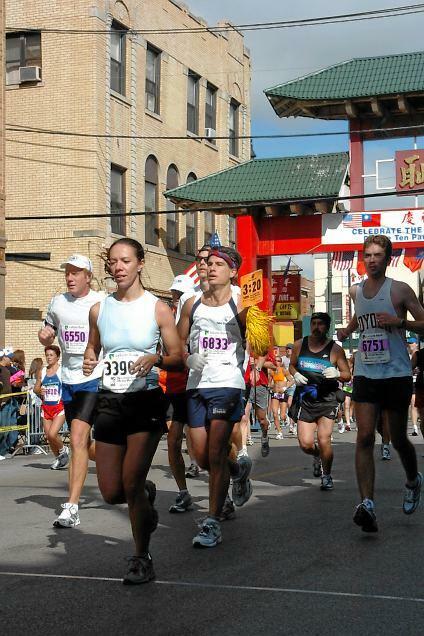 I've been leading marathon training pace groups since 1992. I've probably paced Chicago 13 times by now, with a similar count from other races. I don't ask for cash tips from the people I've paced that are still with me at the finish - just a cold beer. Get the thought of banking time in the earlier miles out of your head - I run the same splits the whole way. If this is your first marathon, practice drinking on the run (or walk) at a smaller race - we do not come to a dead stop to drink at the aid stations.